not be real but my little girl's heart keeps hoping they are. Some years ago my husband's aunt, who is like my big sister, gifted me with 25 gorgeous, amazing Fairy rubber stamps that she found at a thrift store, all unmounted, stained, dirty, dusty and abandoned, to this day, I can't imagine anybody getting rid of this beauties but, there they were, all in a cardboard box for $10.00. After washing them really good, I started stamping them just to see what they looked like and, to my complete surprise and total delight, each one revealed to me the amazing and gorgeous images that are now mine. I've told this story each time I make a card with one of this images so, here is this card I made with one of them, hope you like it. I'm linking this card to a few challenges at the end of this post. For some reason, when I started coloring this sleeping Fairy, THIS SONG came to my head, (it will take a few seconds to start, ok?) do you remember it? if you are as old as me, you might. It gave me a sweet trip down memory lane, my first daughter was just one year old and my hubby and I used to watch this show all the time. I don't know, the World seemed to be a lot simpler back then or maybe, I was just so happy with my little baby girl, that whatever else that might have been going on that was bad, was overlooked. Hope you enjoy listening. I stamped the image onto a die cut panel of Strathmore multi media paper with Versafine black ink and clear heat embossed it, then colored it with SU markers, deep purple Crayola marker and an aqua painter, I added a bit of Dazzling Diamonds to her wings and the butterflies. The pattern paper is from Lili of the Valley (discontinued line, sigh!!😞). The flourish gold die cut I can't remember where I got it and I apologize for that. When I started stamping, I never thought of having a blog so I always threw out the packaging of my stuff, now I wish I'd never done it. The sentiment word is a die from Elizabeth Crafts. 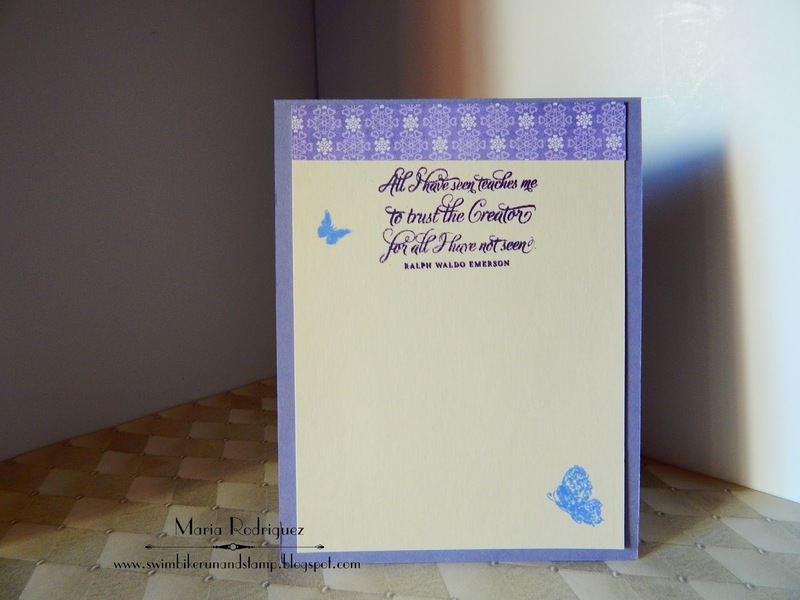 The sentiment is one of my favorites from a retired Flourishes set called "Orchids", the little butterflies from my stash. The Alphabet Challenge "V is for Violet"
Fussy and Fancy Challenge #179 "Angels/Fairies or Winter"
Your Next Stamp "Sketch or Color Challenge" I chose the sketch. Creative Corner Challenge "Anything Goes"
Making Memories Crafting Challenge #1 "Anything Goes"
Hello everyone: Well, things are getting back to a slow normal again, my grandchildren, from the 18 year old to the 9 year old, are back in school, hubby back to work and I'm back in my craft room. We had family from Mexico visiting, my husband's cousin and family came to Chicago for the Holidays so it was fun, although busy but fun non the less. So here I am with my very first Merry Monday card for this 2017, I hope your Holidays were filled with the warmth of family and friends, good food, good bubbly, lots of gifts too. I wish for you and your families, Peace, Health, Joy, Love and Prosperity in 2017. Here is my first Christmas card of 2017, hope I can collect a good amount, because this year, I was a bit short, I made lots of new and dear friends so, here we go, hope you like it. 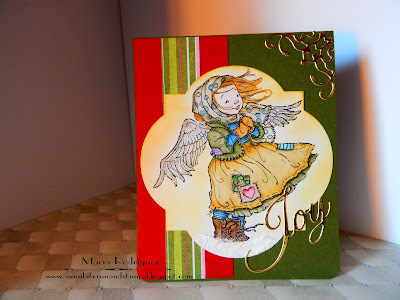 This sweet and beautiful image is from Penny Black and it's called Ragged Angel, I stamped onto a die cut panel of Strathmore multi media paper with Stazon black ink and colored it with SU markers and the aqua painter. The snow under her little boots was done with embossing paste, the pattern paper is from Lili of the Valley (discontinued) and the "JOY" sentiment from Penny Black Love and Joy die set. This sentiment is from the Power Poppy set called O Holy Night and the little candle on the corner is from another Power Poppy set called Merry Littles, I use this set all the time to finish the inside of my Holiday cards. 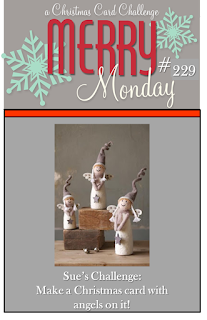 Merry Monday Christmas Challenge #229 ANGELS. Hanna and Friends challenge #264 "Christmas"
ABC Christmas Challenge "A and/or B" A is for "Anything Goes", B is for "Something beginning with B.
Hello everyone: I don't know about you but I LOVE BEER, yes, yes, my hubby and I enjoy a nice cold one (sometimes two😋)in all kinds of weather so, when I saw the CASology challenge yesterday, with the CUE CARD "COLD", the first thing that came to my mind was BEER, not snow, not ice, just beer, are you shocked? LOL!! 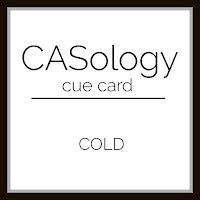 So I made this very simple and hopefully totally CAS card, hope you like it. 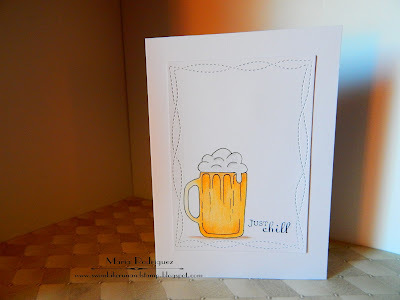 I thought I had a stamp with a beer mug among my stash, I knew I had seen one somewhere but alas!! 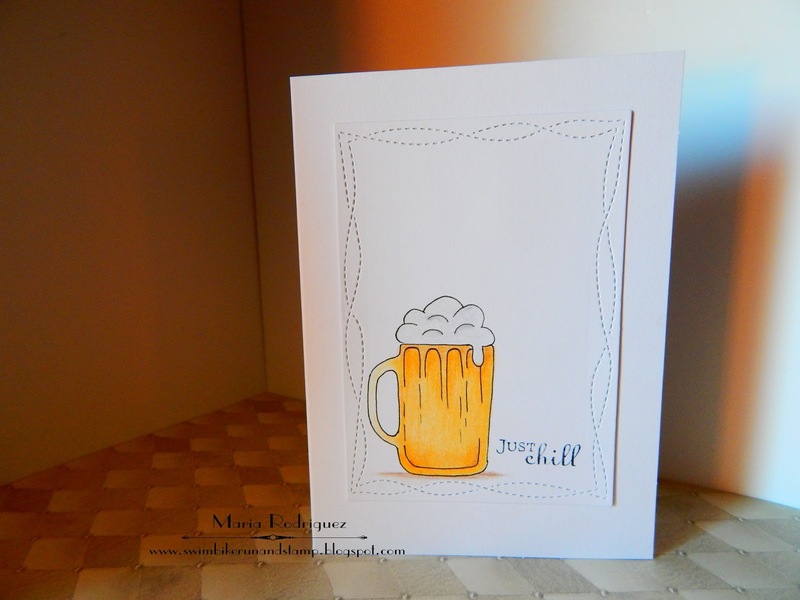 I didn't and then I remember where I saw a picture of a beer mug and it was on the SU 2016-2017 annual catalog as part of a set called Mixed Drinks, (I think I will order this set, love all the images) so, I grabbed the catty and traced the beer mug onto a piece of Vellum with pencil then, transferred it to my die cut panel by rubbing the image with the bone folder, then I went over the pencil lines with a fine tip black pen, easy peasy. I colored it with Prismacolor pencils and paper stumps dipped in baby oil, I added a bit of Wink of Stella to the foam, hope you can see it. 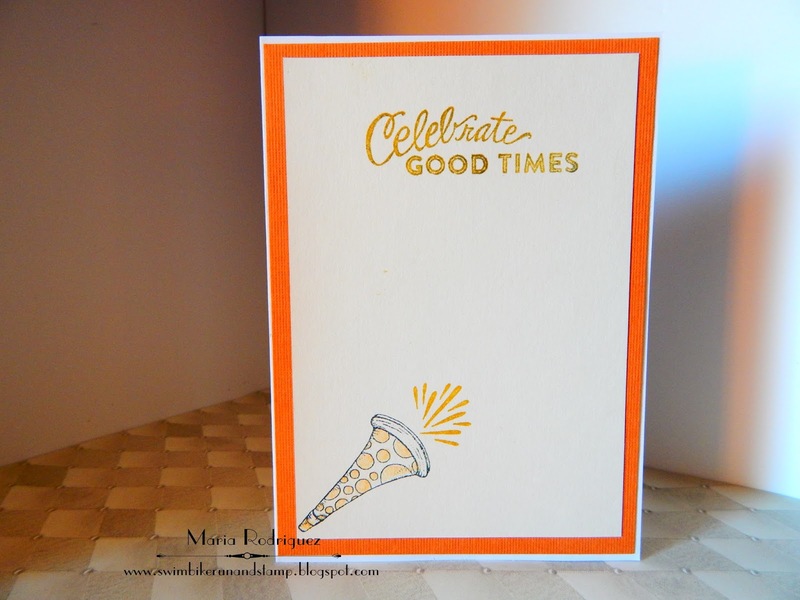 The sentiment is from an old Flourishes set called "Pinwheels and Popsicles". The sentiment and the horn are from a new Power Poppy set called "Marcella's Mixed Tape Volume1"
Crafting by Designs January Challenge "Anything Goes"
The Male Room Challenge #51 "Anything Goes"
Inspiration Destination Challenge #119 "Anything Goes"
Crafty Creations Challenges #332 "Anything Goes"
Hello everyone and welcome to THE FLOWER CHALLENGE's first challenge of 2017!!!!! We hope your Holidays were filled with the warmth and love of family and friends, good food, delicious bubbly and lots of gifts, I'm wishing all of you, Health, Peace, Love, Joy and Prosperity for 2017!! 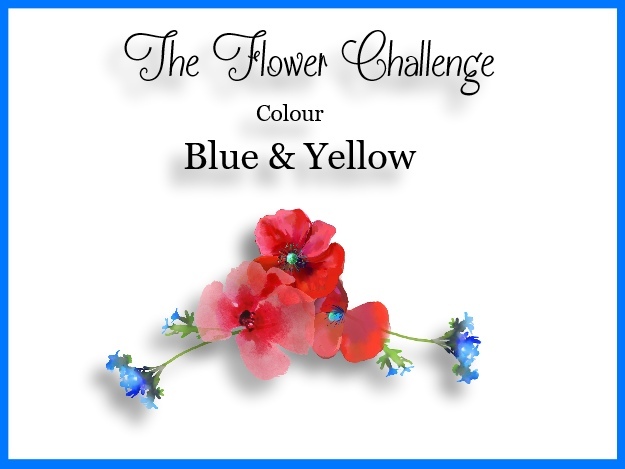 In this new challenge we want you to use the color BLUE and the color YELLOW on your cards, remember, the main focus on them should be the flowers. 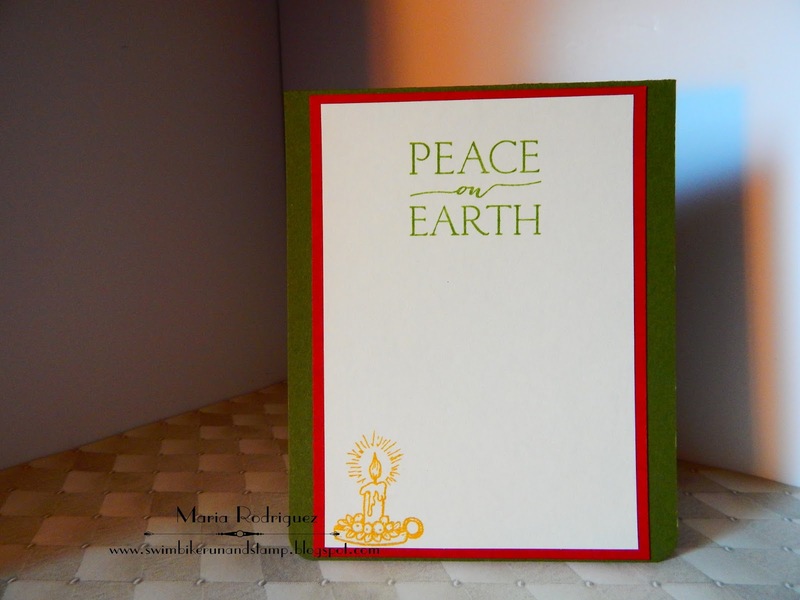 Here is my card that I hope inspire you to join us in the gallery. I stamped the image onto a panel of Strathmore multi media paper with Stazon black ink and colored it with SU markers, the aqua painter and added shadows and highlights with my Prismacolor pencils. The pattern paper is from Lili of the Valley, the sentiment is from the set. The pretty punched detail is from a super old Friskars punch. 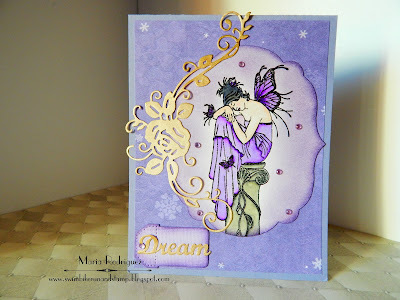 This sentiment is one of my favorites and it's from an old Flourishes set called "Orchids". Please read our rules, they are few but important and also, please use the banner bellow when entering your card on the challenge. For more inspiration, visit my awesome teammates blogs HERE to see their amazing creations and please, join us in the gallery. Thank you for stopping by, I always read every single comment you so kindly leave on my posts, I want you to know that I appreciate this more than words can express. Hello everyone: I hope your Holiday celebrations were filled with the Joy and Warmth of family and friends, good food, lots of bubbly and gifts and that 2017 bring Peace, Health, Love, Joy and Prosperity to all of you and your families. So, here we go with our first challenge of the New Year over at Shopping Our Stash and this time, we want to see you make a card or project that uses shapes other than circles or squares. You can do triangles, hearts, ovals, hexagons, trapezoids, etc. and join us in the gallery. Here is the card I made to inspire you and, for more awesome inspiration, stop by my teammates' blogs. 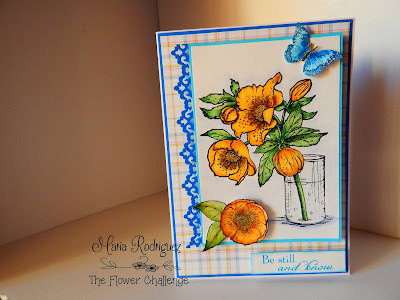 I used a very old and dear stamp set from my stash of Flourishes images, this one is part of a set called "A Year In Flowers 2" I stamped it onto a panel of Strathmore multi media paper with Versafine black ink and clear heat embossed it, then colored it with SU markers and the aqua painter. I die cut both embossed panels with a die that I hardly ever use, it's old and unfortunately, I don't remember where I got it or it's name, it's really pretty so I will make a point of using it more often. The outer layer was cut with my trimmer after I glued the darker card stock, following the shape. 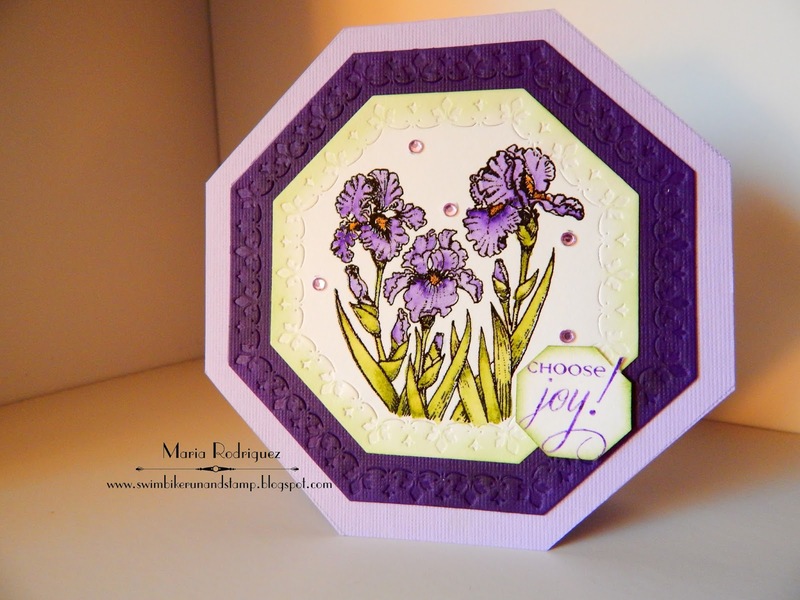 The sentiment is from another old Flourishes set called "Orchids". I cut the insert the same way, both the sentiment and the flower are from Flourishes. 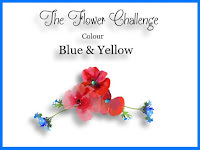 I hope you give this challenge a try and join us in the gallery. First MOJO of the Year!!!!! Hello everyone: Well, I've taken some time off my blog, with the Holidays, family visiting from Mexico, reunions and shopping, not to mention cooking and eating, I really didn't have time to concentrate on making cards, participating on challenges etc. But things are getting back to normal, tomorrow 3 of my grandchildren will go back to school, my other 2 on Thursday and my dear hubby will also go back to work so I will have again time in the mornings to get back into the swing of things but, for now, I have this little card I started in the morning and finished a short while ago, not much stamping or water coloring but still, I like the way it turned out, hope you like it too. 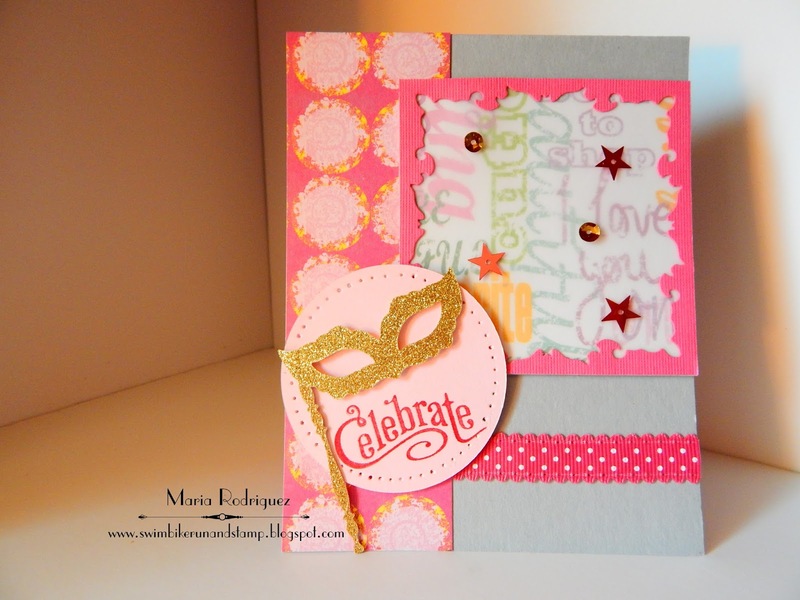 The golden mask is from a Verve stamp set called Masquarade and it has a companion die set that I used to die cut the mask and the stick out of gold glimmer paper. The pattern papers are from my local hobby store, the ribbon and sequences from Stampin' Up! and the sentiment from a retired SU set called "Whimsical Words", I just masked the word "today" and only used the "Celebrate". 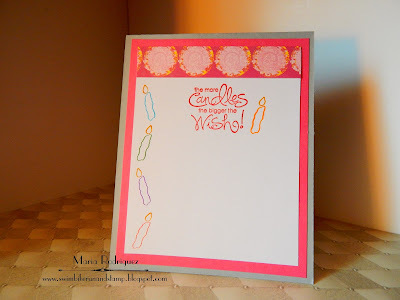 Again, the sentiment is from the same SU set called Whimsical Words, the little candles from my stash. I want to link this card to the following Challenges. Country View Challenges Anything Goes. Creative Craft Cottage #78 Anything Goes. Sparkles Monthly Challenges #87 Happy Birthday.